Entrepreneurs, especially mompreneurs, have the ability to rival even the best jugglers, the likes of those you would pay big bucks to see performing for Cirque du Soleil. Did these ambidextrous women go to clown college to master the art of spinning plates atop long poles or handling fiery batons without singeing a single eyebrow? 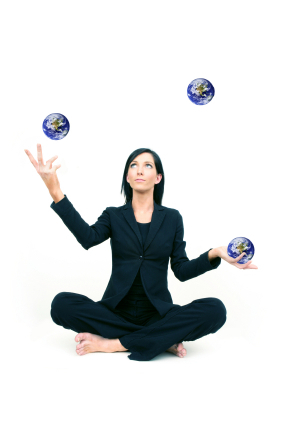 Well, there might be a few (but only those who dreamed of one day touring with Ringling Brothers) — but most businesswomen grow into the role of master juggler by simply having to maintain control over ever-increasing responsibilities at work and at home. Clarify your goals and values for your home/work life, and reflect on them regularly to keep you on track. And don’t be opposed to enlisting your partner or friends to help you keep all your balls in the air when you need an extra set of hands. If you have tips that have helped you become an expert juggler I hope you will post a comment and let me know. I’d love to hear from you. This entry was written by Dr. Shannon Reece, posted on November 2, 2010 at 9:59 am, filed under Alphabet of Entrepreneurs, Aspiring Entrepreneurs and tagged balance, businesswomen, cirque du soleil, entrepreneur, juggling, strategies for women. Bookmark the permalink. Follow any comments here with the RSS feed for this post. Post a comment or leave a trackback: Trackback URL.